Some of my most satisfying days are spent on location, doing documentary sound. Whether we're in a room, out in the world walking/driving around or capturing an unexpected moment, this type of recording is a blast. There are so many stories out there and an endless amount of interesting people with fascinating viewpoints that just call for attention. In this era where DSLR cameras, and to an extent mobile phones, are able to get usable footage in a somewhat stealthy manner, I'm often times the most visible member of the doc film crew. I've got at least a bag with recorder/mixer and transmitters in it and once that boom pole comes out we attract more attention than we'd like. 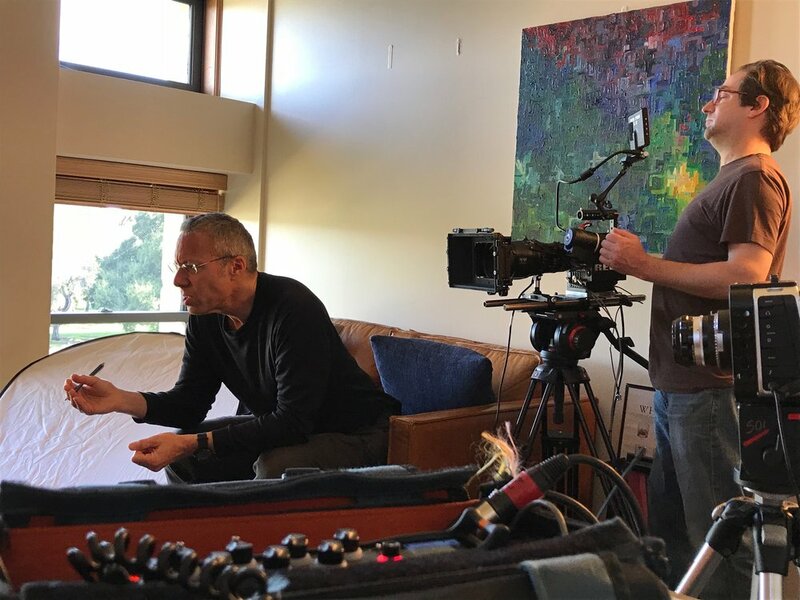 This past weekend Hands on Sound and Bohanti Productions travelled to California's Central Coast to start work on a documentary piece about musician Phil Lee. This was a run 'n gun affair with a couple of proper sit-down interviews tossed in as we got an overview of Phil's world before heading out on tour. With 2 DSLR cameras we grabbed hour upon hour of footage with Phil and had him mic'd up for the majority of his waking hours. Following Phil around town we got a good taste of his local haunts and the folks he encounters. For many of the innocent bystanders our cameras just indicated we are photographers and must be hanging out with someone interesting. It's the bag that gives the crew away, so my deal is to get rolling on the wireless mics and then cover the bag with a jacket or sweatshirt...ending up looking like a guy who is carrying around a bag on his shoulder or is the photographer's helper. In the bag I keep a shotgun mic setup on a pistol grip and that serves as extra coverage when needed...such as when we encounter someone on the street or in a restaurant. 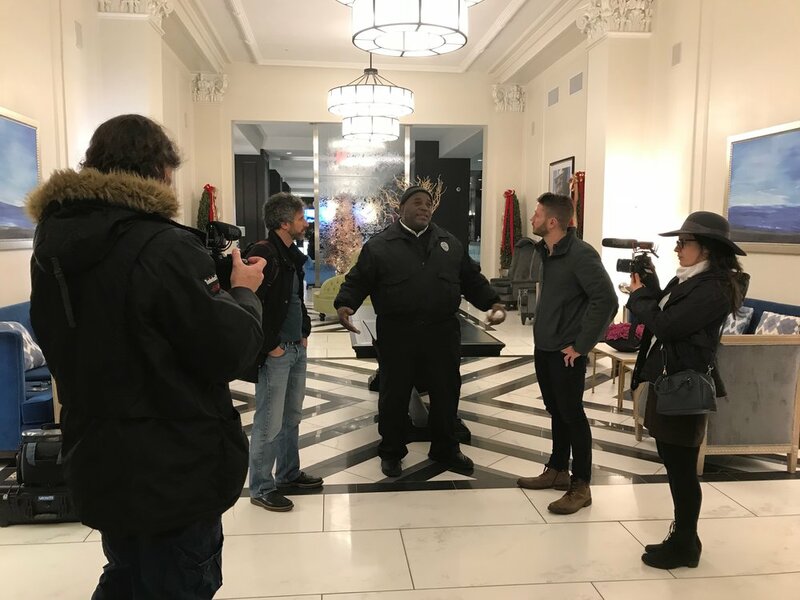 This past December I went out on the road for a couple of fun weeks with the documentary crew from Kindness Films. This was another 2 DSLR shoot + Sound. Most days we had our subjects mic'd up for the day with boom added in controlled situations. In the more guerrilla moments I once again employed the hidden bag and pistol grip shotgun. Documentary sound also give the opportunity to get creative in sound gathering and allows me to play with plant mics, PZMS, handheld recorders and even at times stealthy on my own body mics. Thinking fast and being as invisible are strong skills to have on these shoots since there aren't re-shoots and multiple takes. Interactions are real and in the moment, often fleeting and brief. Ya either catch 'em or ya don't. I like to catch 'em.